Property developer, Bolton Bhd, aims to increase its sales by 50 per cent for its current financial year with the launch of more development projects compared with last year. Its executive chairman, Mohamed Azman Yahya, said with a robust property market outlook, demand was expected to be good. For the financial year ended March 31, 2010, it recorded a pre-tax profit of RM50.7 million on revenue of RM257.473 million. "Our target this year is to increase sales, by 50 per cent compare with last year -- close to half a billion ringgit in sales this year. "A lot of developers held back last year. I think we are getting almost five to six projects out this year and the bulk of the earnings from the projects probably will come the year after," he told reporters after unveiling 'The Wharf' commercial hub in Puchong today. Azman said the 138-hectare project at the Taman Tasik Prima, spread over six hectares of leasehold land, comprised boutique showroom offices (to be launched on Sunday), serviced apartments (Feb 2011 launch), terraced suites and a retail mall (early 2013 completion). "With a total gross development value (GDV) of RM450 million, the one-stop neighbourhood lifestyle development will be well-received by people," he said. He said to-date, more than 1,500 units of properties had been sold while some 90 per cent of these units had been completed and handed over. "With eight hectares left for development at Taman Tasik Prima, Bolton''s development plans include about 3,000 units of terraced houses, serviced apartments, shops and a retail mall. "These properties will provide the company with a GDV and gross development profit of about RM650 million and RM150 million respectively, over the next seven years," he said. Azman said the property market was pretty robust and would probably hold. "Bank Negara Malaysia's policy is quite accommodating. The people still prefer real estate and there is a surge in demand from overseas buyers," he said. Bolton has a landbank of 260ha, of which 70 per cent are in the Klang Valley. Sunway City Bhd's (SunCity) profit after tax and minority interest (PATMI) grew by 442 per cent to RM295 million for the period January-June 2010 from RM54 million in the same period last year. Revenue rose to RM546 million from RM493 million previously. In a statement today, SunCity said the positive performance was attributed to contributions by both the property development and property investment divisions. "For the property development division in Malaysia, the major profit contributions were from Villa Manja in Sunway SPK Damansara, Sunway Giza in Sunway Damansara, Sunway Palazzio in Sri Hartamas and Sunway SPK 3 Harmoni in Sunway SPK Damansara. "As a result of improved economic conditions and strong interest in the property market, all the group’s latest launches have recorded strong sales," it said. SunCity said todate, it has successfully launched projects with a gross development value of RM966 million during the first half of 2010. "The group’s first-half sales amounted to RM424 million and have surpassed the budgeted first-half sales of RM411 million. "With strong sales for all new launches, the group is confident it will achieve the 2010 sales target," it said. It said the group planned to expand to China to grow the international division. For the hospitality division, the flagship hotel, Sunway Resort Hotel & Spa continued to enjoy high occupancy due to positive market sentiment which led to increased leisure and business travelling frequency, it said. It said the leisure segment performed well for this period. "Sunway Lagoon saw a significant increase in its visitors during the first half of 2010," it said. Sunway Pyramid Shopping Mall, the crown jewel of its property investment division continued to generate the highest revenue for the group through stable rental income growth, it said. KUCHING: Ibraco Bhd has announced a proposed regularisation plan to exit the PN17 status that involves embarking on its biggest ever single mixed property development project here. The project, called Tabuan Tranquility and covering 66ha, has a gross development value of RM512mil. Located along the Kuching-Kota Samarahan Expressway, the project will comprise 640 double-storey terrace houses, 86 double-storey semi-detached houses, 60 townhouses, 76 four-storey shophouses, 72 semi-detached industrial buildings, 47 residential detached lots and one office block. Ibraco signed a conditional joint development agreement on the project with its wholly-owned unit Ibraco LCDA Sdn Bhd and landowner Wee Song Ching on Wednesday. The 66ha land is jointly owned by Ibraco, Ibraco LCDA and Wee. Ibraco will buy the 2.62ha owned by Wee for RM16mil via the issuance of 16 million Ibraco shares. Ibraco chief executive officer Chew Chiaw Han said earthworks for the project had been completed and infrastructure work was under way. Chew said the 76 shophouses would be built first, adding that 80% of the units had been sold since the launch more than two weeks ago. The shop houses are priced between RM1.07mil and RM1.8mil each. “The entire Tabuan Tranquility project is expected to be carried out in phases for completion in 2015. 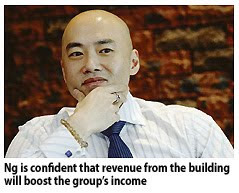 “We will open sales for the residential properties within three months,” he told StarBiz yesterday. The project, to be financed by internal funds and bank borrowings, is expected to generate an estimated gross profit of RM82mil. AmInvestment Bank Group, in announcing Ibraco’s proposed regulatisation plan, said the Tabuan Tranquility project was expected to give the Ibraco group a steady stream of income for the next five years, and that it would contribute positively to the group’s future earnings. The plan is expected to be completed by the first quarter of next year, paving a way for the lifting of Ibraco from the PN17 status. On completion of the plan, Wee’s stake in Ibraco would balloon to 17.32%, from 4.03%, and he would emerge as the second largest shareholder. Sharifah Deborah Sophia Ibrahim, the current single largest shareholder, would see her equity interest diluted to 21.7% from RM25.07%. Sharifah is the daughter of Ibraco founder, the late Wan Alwi Ibrahim, whose family once held more than 60% stake in the company. Singaporean Ng Cheng Chuan and Hiap Ghee Seng Sdn Bhd, controlled by Chew, would end up with stakes of 16.61% and 11.08% respectively. Ibraco has developed more than 404ha in Tabuan and Stutong areas and built over 10,000 properties over the years. GOLDIS Bhd, an investment company, is optimistic of being back in the black for the rest of the year, helped by rental income from its GTower commercial building in the heart of Kuala Lumpur. Goldis' first quarter net profit fell 49 per cent, partly caused by the delayed opening of GTower. To date, the building has 60 per cent tenancy. Goldis aims to raise it to 75 per cent by January next year. GTower Sdn Bhd executive director Colin Ng expressed confidence that revenue from the building would boost the group's earnings. Ng was speaking to reporters after the launch of MSC Malaysia status for GTower in Kuala Lumpur yesterday. Goldis invested RM5 million in the building's fibre optic connectivity and 150,000 sq ft of net lettable area has been allocated for MSC Malaysia-status companies. GTower is the first fully-certified green commercial building in the country, with grade A++, Green Mark GOLD and MSC Malaysia status. Meanwhile, Multimedia Development Corp chief executive officer Datuk Badlisham Ghazali said it was planning to open two more MSC Malaysia buildings in the Klang Valley by the year-end. "We are continuously evaluating more buildings," he said, noting that there are 19 MSC Malaysia cybercities and cybercentres in operation nationwide. In his speech earlier, Badlisham said the government was committed to the rollout of cybercities and cybercentres to ensure that the development and benefits of MSC Malaysia were extended to the business communities. SELANGOR State Development Corp (PKNS) hopes to achieve at least 85 per cent of the RM750 million sales targeted by the year-end. To date, PKNS has made RM360 million sales. Last year, its sales amounted to RM390 million. "We are optimistic of achieving at least 85 per cent of the sales target based on the number of projects we have launched this year," PKNS deputy general manager (administration and development) Md Nasir Md Arshad said in Shah Alam, Selangor. There are more than 50 housing projects being developed by PKNS currently. It has launched 38 so far this year. The agency plans to launch at least two more after the festive season in Alam Nusantara in Setia Alam and Puncak Tropika in Section 9 Shah Alam. PKNS is one of the key sponsors for the Selangor Lifestyle and Property Expo 2010 (Selpex 2010), which will be held at the SACC Convention Centre on October 29-31. The inaugural expo is expected to attract some 30,000 visitors. More than 100 exhibitors are expected for the three-day expo comprising property developers, financial institutions and interior designers as well as those in the business of home decor items, landscaping, and travel and holiday packages. Md Nasir said PKNS hopes to generate some RM7 million sales during the expo, with the help of several incentives. "Due to the overwhelming response we received when we offered incentives at other showcases, we decided to continue with the offerings during Selpex 2010, and will continue to offer them until the year-end," he added. The incentives include waivers of stamp duty and legal fees, rebates of up to RM10,000, 24 months defect liability period and easy installment schedule for the 10 per cent downpayment. Property developer and manager Kwong Hing Group has bought Menara Pan Global, located within the Golden Triangle, for an estimated RM160 million from PanGlobal Bhd, sources say. 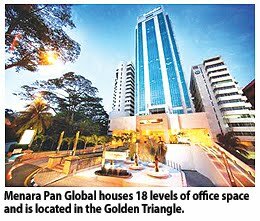 Menara Pan Global, a 38-storey building in Jalan Puncak, off Jalan P. Ramlee, houses 18 levels of office space with a total built-up of 400,000 sq ft. The 18-year-old building also houses nine levels of hotel suites operated by Pacific Regency, while another eight levels have a total of 420 parking bays. A source told Business Times that Kwong Hing paid a deposit for the purchase last week. The group, whose prized assets includes Wisma Hamzah Kwong Hing in Lebuh Ampang, now has assets valued at RM600 million. An official from Kwong Hing declined to comment when contacted. It is understood that Kwong Hing may invest further to upgrade both the office space and suites to better compete with offices in the Golden Triangle. The office lots are said to have 70 per cent tenancy. Similarly, Kwong Hing will do some work on the 153-suite Pacific Regency, famous for its rooftop Luna bar, to improve its average room rate. This purchase will see the group venturing for the first time into the hospitality sector. A source said that the management team and the staff of Pacific Regency will be maintained where possible. However, the name of the building could change. It is understood that the sale forms part of PanGlobal's restructuring exercise. The company was delisted from Bursa Malaysia in July last year. The Kwong Hing group's properties include Wisma KH in Jalan Sultan Ismail, Plaza Pengkalan in Jalan Ipoh and Wisma Fui Chui in Jalan Cheng Lok. It also owns shopping centres along Jalan Tuanku Abdul Rahman and Jalan Petaling and Bangunan HSBC in Medan Tuanku. KUALA LUMPUR: Majuperak Holdings Bhd announced that its wholly-owned subsidiary, Syarikat Majuperak Bhd, will jointly develop 184ha in Batu Gajah, Perak, with Xtreme New Sdn Bhd. A memorandum of understanding to facilitate the joint development was executed on Aug 18 and both parties had agreed that a joint-venture agreement would be signed in three months, it told Bursa Malaysia. KUALA LUMPUR: Property developer Hua Yang Bhd is to undertake a fundraising exercise next year to raise between RM50mil and RM100mil which will be used for land acquisition. At present, Hua Yang’s gearing level was 0.3 times and its financial position remained comfortable.